786 pages | 43 B/W Illus. Mathematically demanding, but also rigorous, precise, and written using very clear language, Advanced Mechanics of Continua provides a thorough understanding of continuum mechanics. This book explores the foundation of continuum mechanics and constitutive theories of materials using understandable notations. It does not stick to one specific form, but instead provides a mix of notations that while in many instances are different than those used in current practice, are a natural choice for the information that they represent. The book places special emphasis on both matrix and vector notations, and presents material using these notations whenever possible. The author explores the development of mathematical descriptions and constitutive theories for deforming solids, fluids, and polymeric fluids—both compressible and incompressible with clear distinction between Lagrangian and Eulerian descriptions as well as co- and contravariant bases. He also establishes the tensorial nature of strain measures and influence of rotation of frames on various measures, illustrates the physical meaning of the components of strains, presents the polar decomposition of deformation, and provides the definitions and measures of stress. 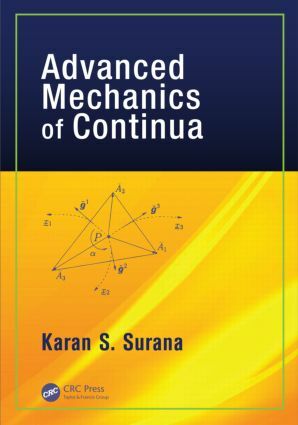 Advanced Mechanics of Continua prepares graduate students for fundamental and basic research work in engineering and sciences, provides detailed and consistent derivations with clarity, and can be used for self-study. in the fields of engineering and mathematical physics." "The book Advanced Mechanics of Continua is a complete reference for both students and researchers in the field of material sciences and applied mechanics. It contains comprehensive and detailed representation for the mechanical behavior of solids and fluids. The constitutive laws for different types of materials are presented separately in this book which helps the readers to understand the concepts without confusion. The choice of gradually developing formulations for different subjects eases the grasping of material for the readers and makes the book an excellent reference for graduate students. "This textbook gives a very rigorous analysis of continuum mechanics covering complex topics in Eulerian and Lagrangian kinematics and stress measures for finite deformation problems. … The book covers all the key topics required to gain a foothold on the complex concepts of continuum mechanics. … The discussion on kinematics provides a rigorous analysis of kinematics in different reference frames. This is often treated briefly in other comparable textbooks. … The author has succeeded in providing an exhaustive resource for advanced graduate students and researchers interest[ed] in mastering continuum mechanics." Karan S. Surana attended undergraduate school at Birla Institute of Technology and Science (BITS), Pilani, India and received a B.E. in mechanical engineering in 1965. He then attended the University of Wisconsin, Madison where he obtained M.S. and Ph.D. in mechanical engineering in 1967 and 1970. He joined The University of Kansas, Department of Mechanical Engineering faculty where he is currently serving as Deane E. Ackers University Distinguished Professor of Mechanical Engineering. His areas of interest and expertise are computational mathematics, computational mechanics, and continuum mechanics. He is the author of over 350 research reports, conference papers, and journal papers.